Today is too warm for March. And too humid. It feels like June. The sky is low and gray. The yard’s air is clotted, a claustrophobic weight that has me hiding in my office, where a tower of neglected paperwork teeters on the brink of deadlines. To lighten the mood, I took a brief stroll through the butterfly archives. 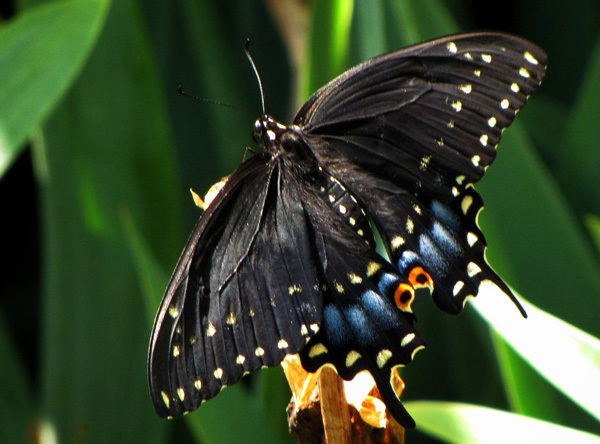 This was my first “successful” butterfly photo, taken in July of 2010. This is a beauty! In case you are wondering, this species is an Eastern Tiger Swallowtail. The male always has a yellow, background color. The female may be yellow like the male, or black like the one in your photo. Beautiful capture. How did you know I love butterflies. My 1st and only tattoo is of a butterfly, I want a butterfly garden. I once took a bird watching course. That is what we have in common, thank you for coming by my blog and sharing your world. I want a butterfly garden, too! There’s a lovely one at Norfolk Botanical Garden. Exquisite, Rae! I adore butterflies! We had some very abnormally warm and humid temperatures the week before last…brought trees and perennials too forward, and especially dangerous for the fruit orchards…as we experienced one very hard frost last week and now have snow on the ground. I’ve seen both April 7 and April 15 listed as the last frost date for our region. We had a close call earlier this week, but it seems we are unlikely to see another true frost this year. I don’t know what I’d do, if we got snow! Makes my feet cold, just thinking about it.